It is remarkable for a distinguished scholar to devote a lifetime to a single research program, but that is what Samuel Hollander has done with his four monumental studies of the classical economists…. 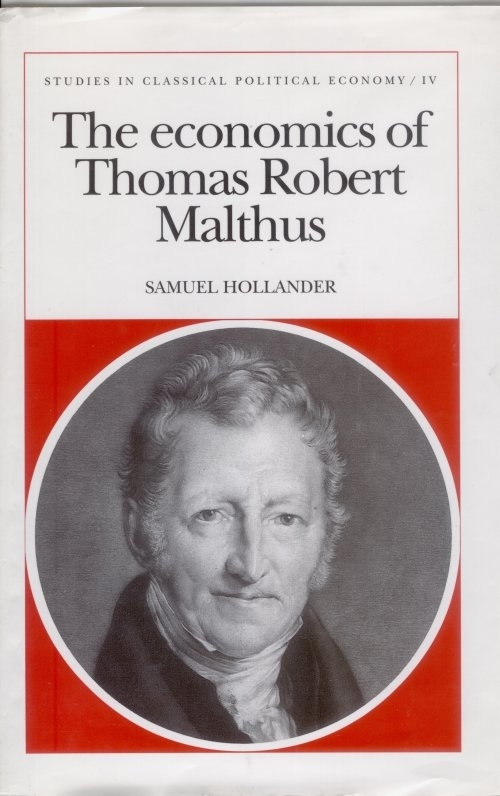 In this last study of Thomas Robert Malthus … Hollander has made perhaps his greatest contribution to the history of economic thought, if for no other reason than because he has demonstrated conclusively that Malthus with the other three pioneers deserves a front-rank place in the march of history…. Hollander has continued in this tradition [J. J. Spengler’s] but with a thoroughness that will dazzle even the most hardened scholars. Clearly, a brief review can hardly do justice to a work as comprehensive and of the depth of Hollander’s Malthus. Formidable in its mastery of detail and always taking stock of Malthus’ contribution, the book takes its place alongside Hollander’s previous works as an indispensable source for understanding classical political economy. The book also affirms Samuel Hollander’s standing as a great scholar of the subject.